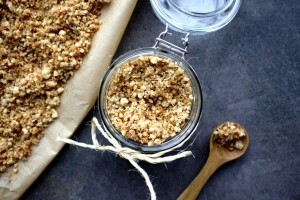 Granola - A delicious and healthy breakfast. Ready in minutes! Granola is my new favourite breakfast food. After over two years, I feel like I am having cereal again. Only it tastes way better and has none of the sugar and other nasty additives. 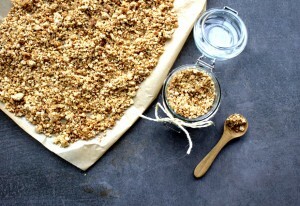 It’s so easy to make a big batch of this granola. I store mine in a Mason Jar and it keeps fresh for up to a week. It won’t last around the house longer than that anyway! I have purposely finely ground this granola. It tastes nicer and is much easier to digest. If you’re just starting out on the Specific Carbohydrate Diet (SCD), then maybe this recipe isn’t for you. Everyone heals at a different pace but I couldn’t tolerate whole nuts until I was on SCD over a year. It was well worth the wait! Honestly, I would never go back to sugar-laden, regular cereals. This tastes great on its own with fresh fruit or on top of SCD yoghurt. I must be honest with you. I love eggs but I think I overdid them a bit. Even though eggs are so versatile and I eat them in so many different way, every day was just too much. Did you know that a wide variety of foods is necessary for a healthy gut? I tell myself this regularly so that I don’t get stuck in a rut. It’s easy to fall into the trap of eating the same foods every day but I try my best not to. I remember those wise words someone told me when I started SCD first. Balance is key – eat everything in moderation. That said, this granola is so good you’ll want to eat it every day! This also doubles up as a delicious crumble to have over your applesauce. Now, there’s a genius idea. Breakfast for dessert and dessert for breakfast :)!